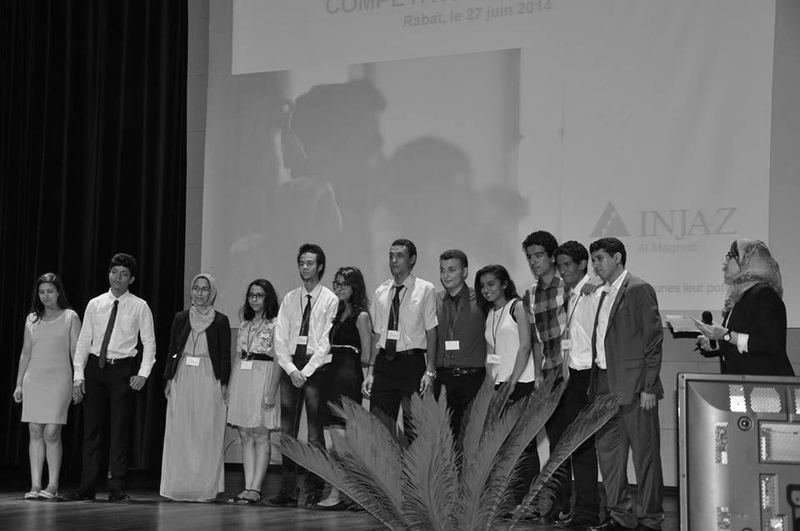 Company Program is the flagship program of INJAZ. 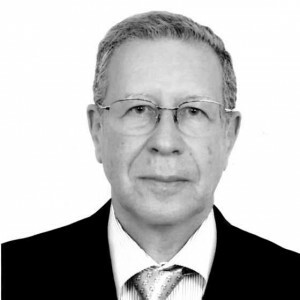 The most complex to set up (it is dispensed in 16 sessions of one hour and a half), it is also closest to the primary mission of INJAZ. It ends with a series of competitions bringing together all the micro-enterprises created by this program in the same year. INJAZ Al-Maghrib and the SNCF Foundation signed a partnership agreement for the promotion of citizenship among youth. 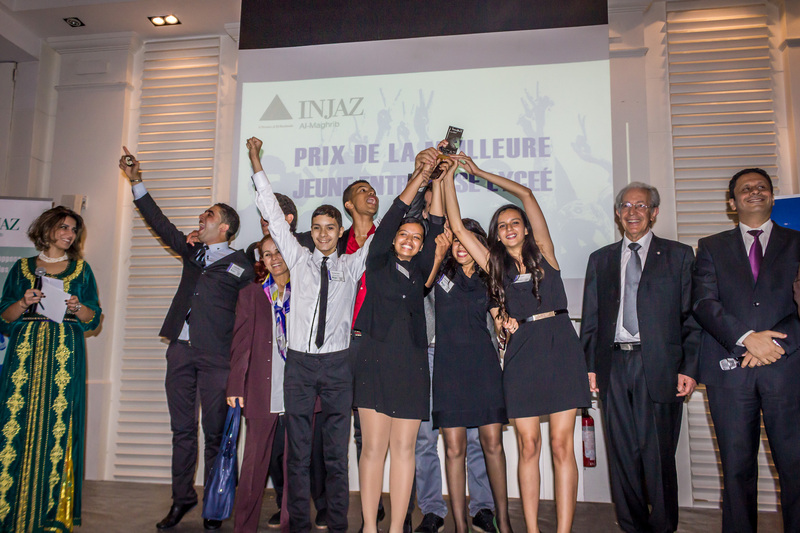 With the support of the SNCF Foundation, INJAZ Al-Maghrib will deploy in 2016/2017 the Company Program, adapted to citizenship to the profit of 3 600 youth of rural areas in Tangier, Kenitra and Rabat. 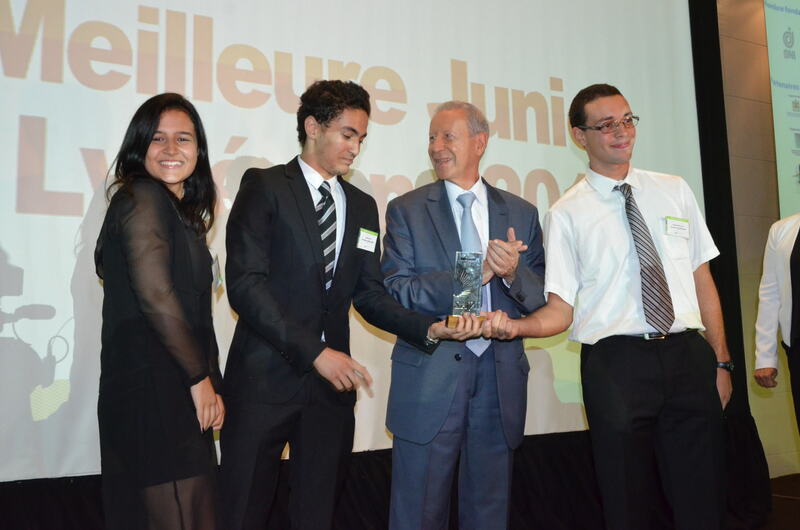 In this context, the Junior Companies will compete to the prize of the Best Social Junior Company special SNCF. 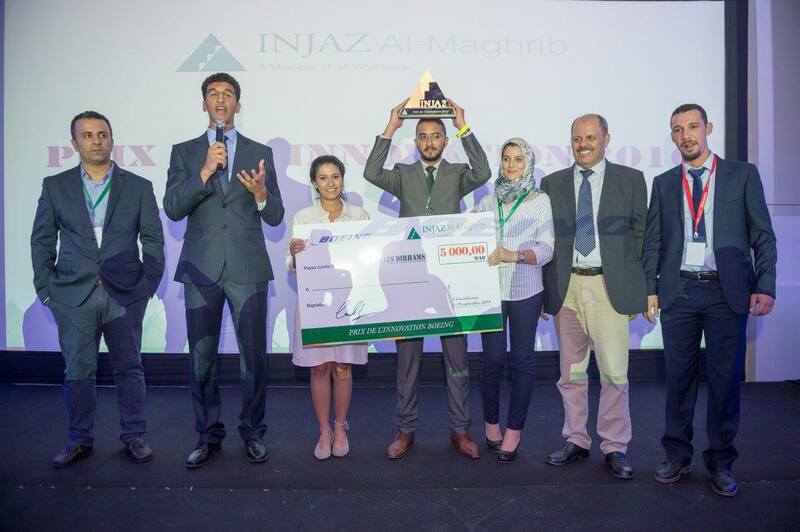 The prize of the Best University Junior Company was awarded to ECO OUIFIA from the Faculty of Sciences of El Jadida, supervised by Mr. Haddar from OCP and professor Mrs. Bakasse – recycling waste paper, sawdust and marine solid waste to make briquettes “bio fuels” that replace wood. 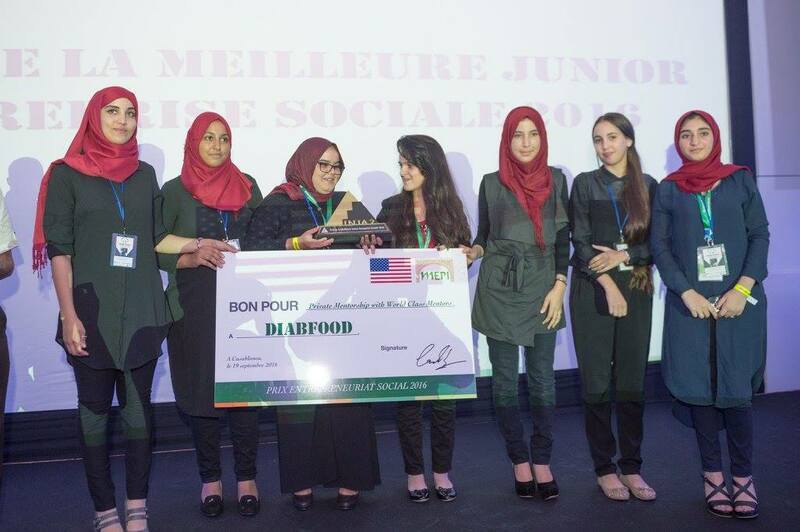 The prize of the Best Social Junior Company – MEPI was awarded to DIABFOOD from Ibn Al Haytham high-school of Kenitra, supervised by Mr. Lamzouri – delivery of meals recommended by physicians and prepared by associations specifically for diabetics. 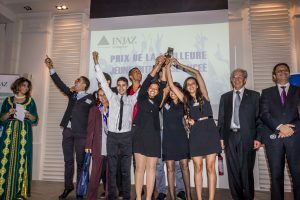 The i-Tech prize – INWI was awarded to FINE BUS from Zerktouni high-school of Agadir, supervised by Mr. El Yousoufi of Inwi and professor Mr. Makroum – designing an application location of bus stops for passengers. 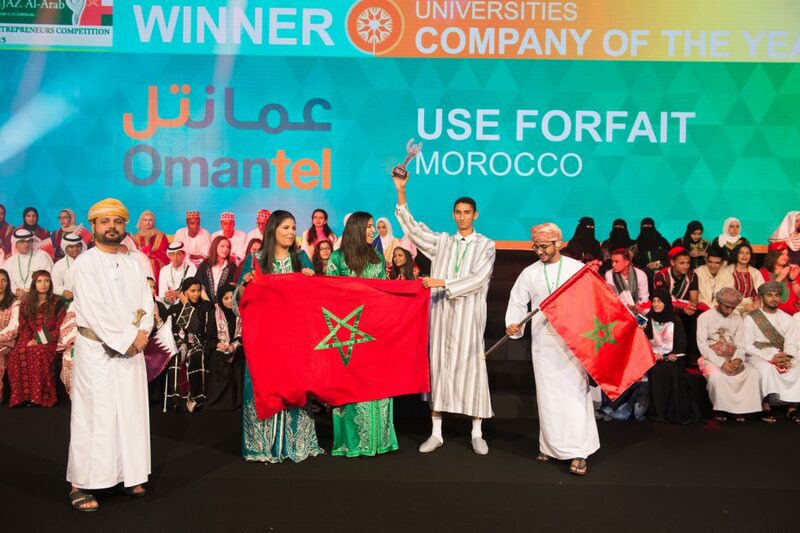 USEFORFAIT, represented by Ismail Bougaillou, Rime Bakhir and Azelmat Mayssae, students at the Faculty of Economics of Rabat and supervised by Mrs Narjiss ZERHOUNI from Bee-Agency, won the award of the 2015 Best Junior Arab Company for the creation of a platform allowing to convert minutes or hours not consumed of a phone plan into vouchers or into donations to the benefit of associations. 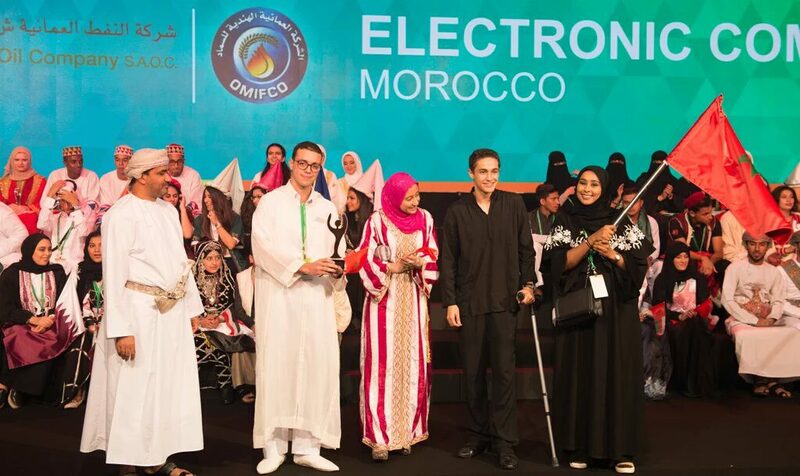 ELECTRONIC COMPANY represented by Imane Hmiddou, Adil Bouhlassa and Ouassim Benchekroun, students from Moulay Youssef high-school of Rabat and supervised by Mrs Hasna OUTLA and Mr Amine Zehraoui from the Exchange Office, won the Award of the Most Innovative product for the conception of a charger incorporating three different power sources ( electric, solar and mechanical). 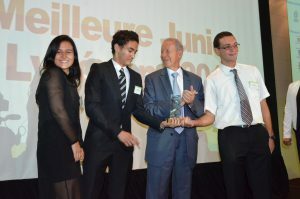 The award of the Best Young high-school 2015 company is ELECTRONIC COMPANY from Moulay Youssef high-school of Rabat, supervised by Ms OUTLA and M.r ZAHRAOUI. ELECTRONIC COMPANY designs a charger that incorporats three different power sources: 2 renewable and and 1 electric. 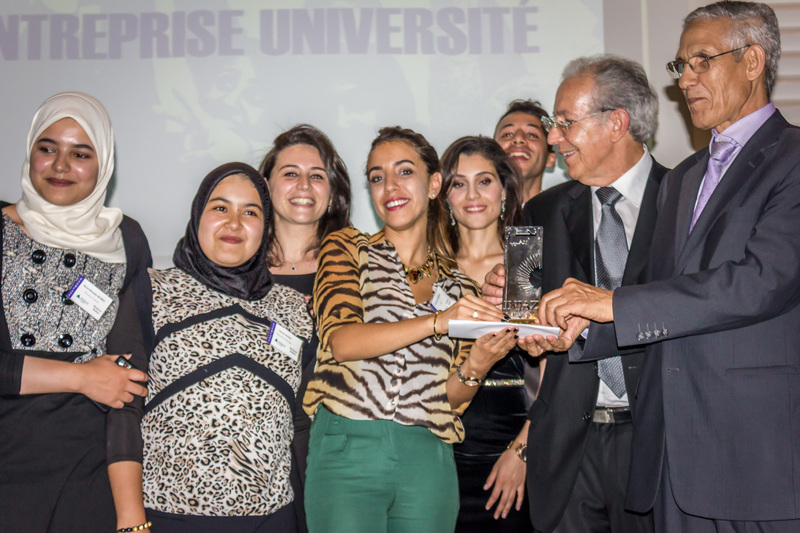 The award of the Best Young 2015 university company is USEFORFAIT from theEconomics, Law and Social Faculty of Souissi, supervised by Ms. ZERHOUNI. 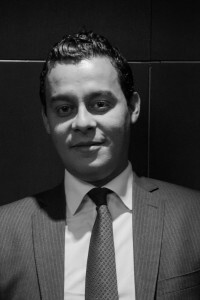 USEFORFAIT is a platform that convert non-consumed minutes or hours of a phone plan with vouchers. 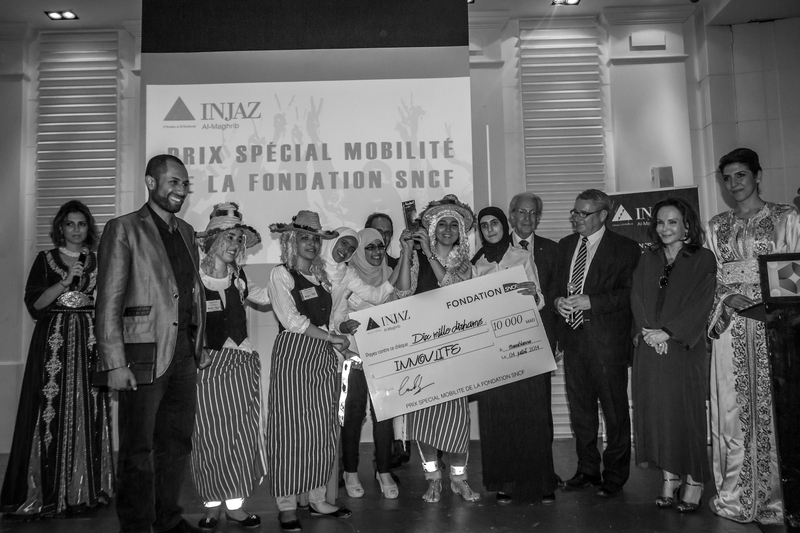 The special mobility prize of the SNCF Foundation was awarded to GUARD MY RIDE of Mohammed V University , supervised by Mrrs MANNI and Mr. EL JAZOULI. GUARD MY RIDE is a detector of any type of movement or displacement of a car. 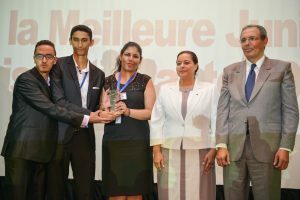 The favorite public project was awarded to AMIS CREATEURS from Torres High School of Tangier, supervised by Ms. ZIDA of the Delegation of Trade and Industry. AMIS CREATEURS transforms the mechanical energy into electrical energy using a bicycle. 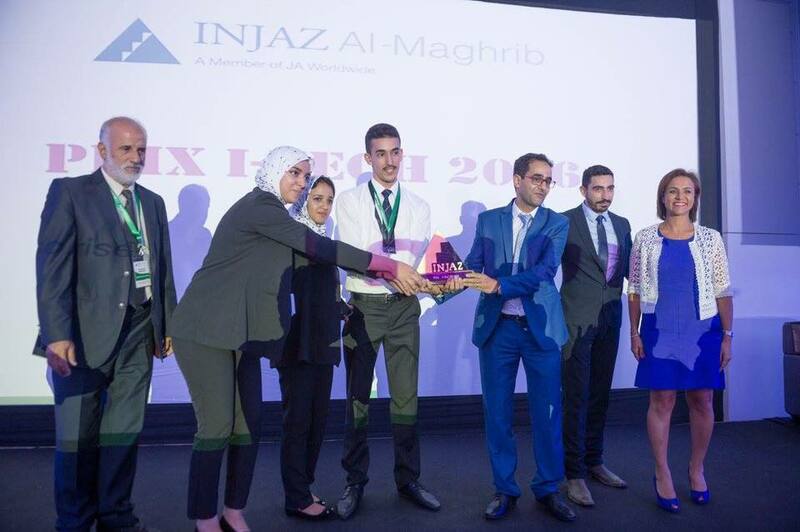 Every year, the winners of the National Company Program Competition go on to participate in the regional competition organised by an INJAZ Al-Arab member country which brings together winners of all national competitions. 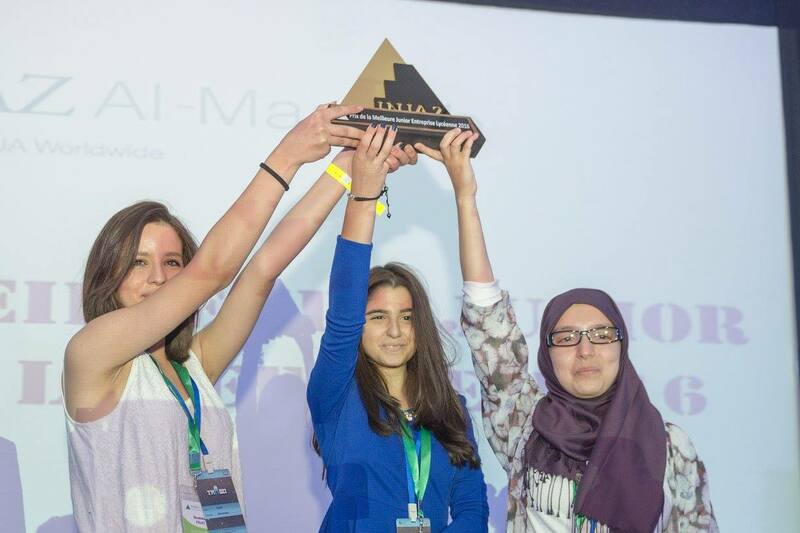 The 2014 edition of the MENA competition was held in Kuwait from December 1st to the 4th 2014. 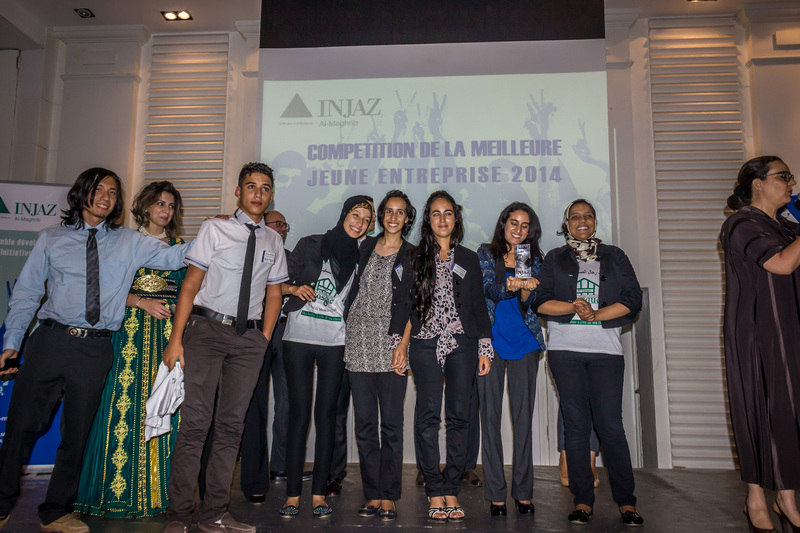 Morocco was represented by two junior companies, Recycle Coffeee and Restyve. 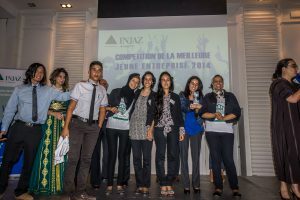 In front of a panel of judges from the corporate world and a large audience who had come to cheer them on, Recycle Coffee and Restyve, representing Morocco, competed n the high school and university categories at the MENA competiton for best junior company 2014. 18 teams from 13 MENA countries competed this year. 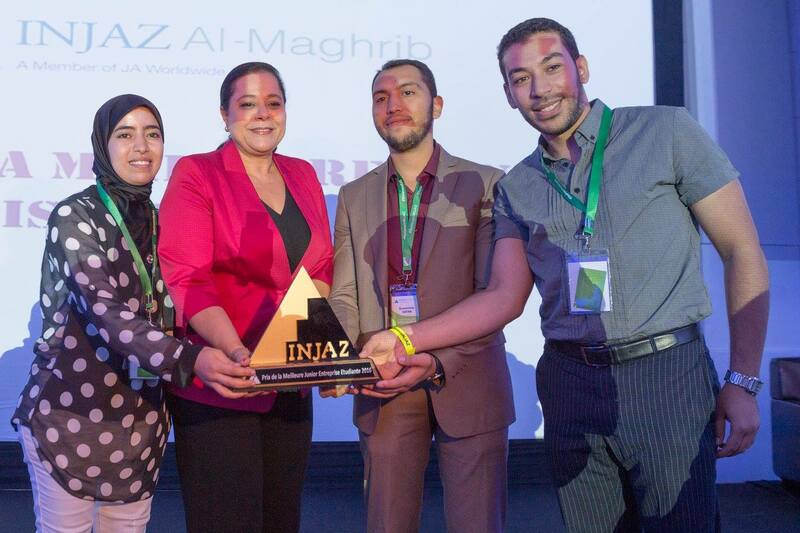 Wa warmly congratulate the recycle coffee team for winning the 2014 innovation award. We also congratulate the volunteers, Alcatel-lucent executives, Mr Benyahia and Mr Zalagh and their supervising teacher, Ms Najmedinne. A special mention must be made to the Boston Consulting Group which provided coaching and helped these youngsters prepare their presentations. 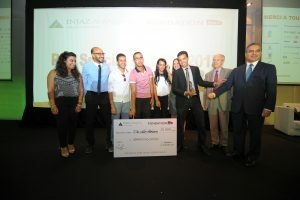 This prize was awarded to RECYCLE COFFEE of the Omar Al Khayam high school of Rabat supervised by the professor Malika Najmedinne and the volunteers Mr Benyahia and Zalagh from Alcatel-Lucent. 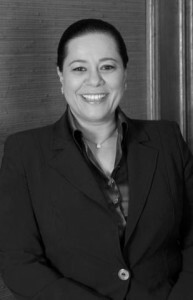 This prize was awarded to RESTYVE of the Faculty of the Legal, Economic and Social Sciences of Rabat, supervised by the professor Dinia and the volunteer Meftaha Slaoui of CDG Capital. 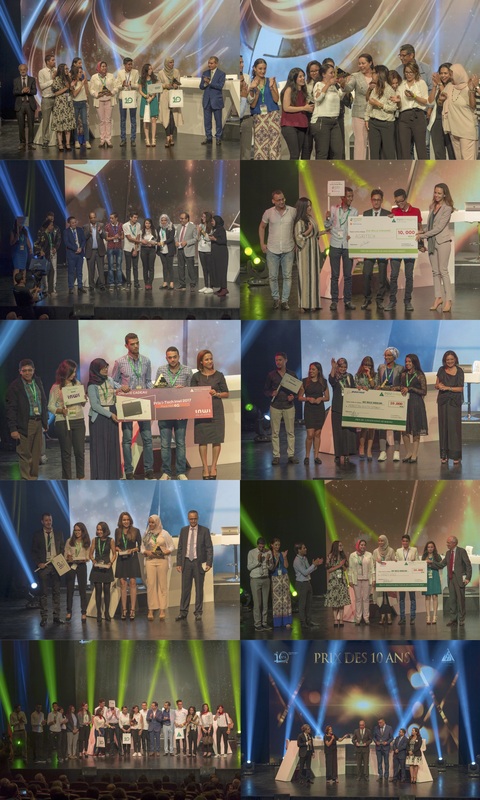 This prize was awarded to TAJELEC of ENSA of Safi supervised by the professors Elghouat and Touriki and by the volunteer of the ACO, M. AIT ELMOUDDENE, Agouzoul, Badi and Anaynaa. This prize was awarded to AB KIOSQUE of the Miason des Jeunes El Borouj supervised by Mrs. Martha Fedorowicz from Peace Corps and Nabila Achaaloune from BMCE. 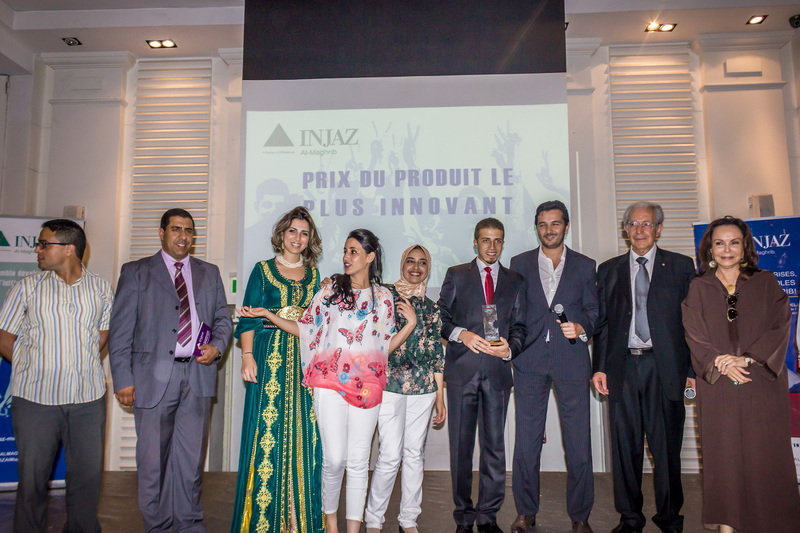 SNCF foundation and INJAZ Al-Maghrib awarded for the 2nd consecutive year two Mobility Prizes to recognise young entrepreneurs who had set up a Junior company around the mobility them.The panel of judges included Mr Richard Ramon, Manager of the SNCF Foundation, Mr Jaouad Tahiri, Vice-chairman of Axa Morocco, Mr Ali Zerouali, CEO of MCS and Ms Nadège Lucchetti, Programs manager of ONA University. The SNCF foundation’s mobility award was presented to INNOVLIFE, set up by students from Hassan II high-school in Tangier, supervised by Mr Mohamed Allal of Novec and Professor Mr Boudhir Anouar Abdelhakim. 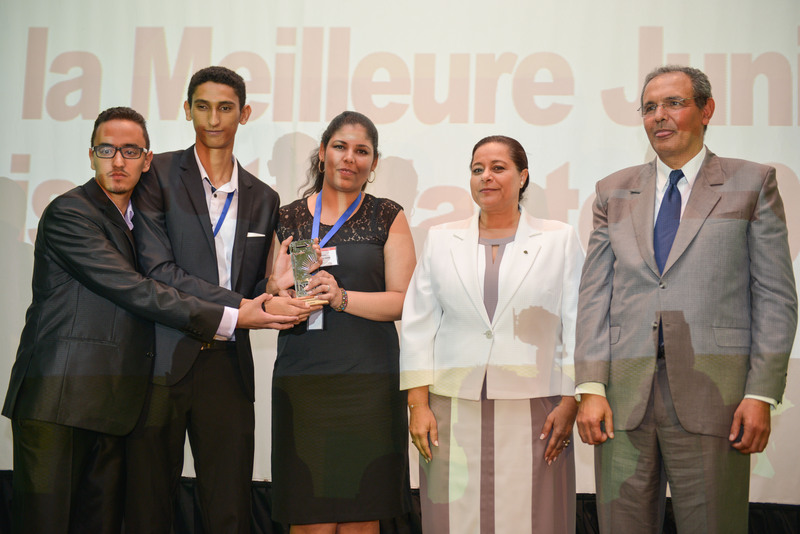 The Judges’ special mobility award was presented to HANDI SMILE founded by students from Abidar Al Ghiffari high school in Rabat, supervised by Mr Rachid Bouzghiba from Novec. The SNCF Foundation and INJAZ Al-Maghrib launched, every year, a special mobility prize for young entrepreneurs who have created their companies in the Company Program. 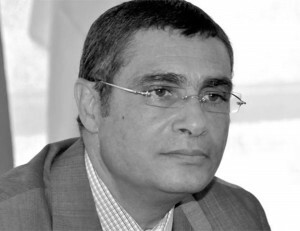 The projects related to the mobility activity will participate in this competition that offer 10 000 DH. 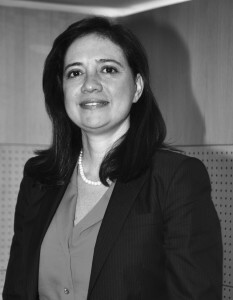 The 7 finalists of this competition will present their projects in front of a jury to elect the best project.